“The race for college financial aid is staring sooner…The Oct. 1 opening date is new this year; traditionally, FAFSA filing season didn’t begin until Jan. 1. 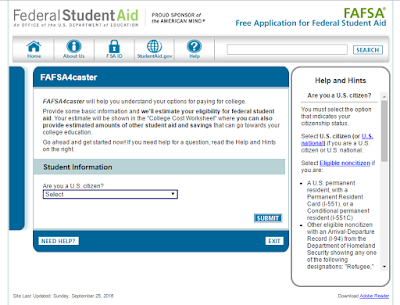 U.S. Department of Education officials have moved the date up by three months in the hope that colleges will get aid offers to prospective student’s sooner, giving those students more time to compare packages and make their choices....Now, the FAFSA is to be based on the “prior-prior year” taxes — for this year, 2015." To complete the FASFA form, see https://fafsa.ed.gov/ .